The Berth 9 and 10 structural bulkhead and marine infrastructure within Slip 1 will be relocated 150 feet south of its present location in order to widen the Slip from its existing 300 feet to a total of 450 feet. The project team will coordinate with the petroleum industry to relocate their facilities prior to construction. In addition to the new bulkhead, the construction project will need to dispose of known contaminated soils in the project area. Current Status: The Board of County Commissioners approved the design contract with HDR in February 2017; preliminary design is underway with draft design reports submitted in July 2017. 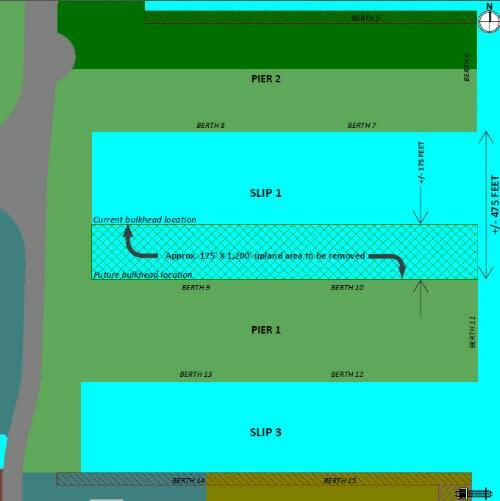 Basis of Design Report and Full Programming Report outlining preferred alternatives for Slip expansion have been delayed due to additional studies needed for the project sequencing. The Basis of Design is now due June 2018 and the Full Programming Report is due in August 2018.